Bones was my high maintenance ADD Clown. Bones would go over, around, or through anything for a squeaky toy. 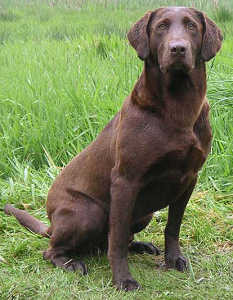 Bones and my sister, Dorothy Gilmore, from Denver won the Umpqua Valley Retriever Club's 10 Singles Competition in 2006. Dorothy had never handled a dog. I worked with both of them for one afternoon. They won the competition and the Calcutta! Bones became a 2008 Master National Finalist after he and Dianne competed in an eight day competition in Minnesota in September. Bones is also a Master Hunter, Qualified All-Age, and has finished some Opens in field trial competition. Bones was on the 2004 Derby List with 12 Derby Points and 5 JAMs in 14 starts. Bones is handsome, agile, hard charging, and athletic with a medium chocolate coat. Bones is a well socialized house dog. He gets along well with people and other dogs. Three of Bone's grandparents are FC-AFCs. FC Clubmead Head Over Heels is a full brother to FC-AFC DB's Cracker of Clubmead (Ritz). Smoky Hill Pepsi was QAA and lived until the age of 17. Pepsi's sire is FC-AFC Castlebay's Slew Man Two. No Fear's sire is FC-AFC Black Gold's Kates Rascal. Only two chocolates are in Bone's pedigree - one in the 4th generation and one in the 5th generation. This is a remarkable and important addition to the chocolate gene pool not available in any other chocolate.....with the exception of Merganser's Classic Matlock.